The Saniflo Saniaccess 2 Up Flush Macerator pump is the best half bathroom pump you can buy. This new pump combines the proven pumping capability of the Saniflo 1/2 hp pump/cutting system and the easy access panels which provide customers the ability to easily clear an item that may be accidentally flushed. This listing is for the pump only, it needs to be used with either the round or elongated rear discharge bowl. 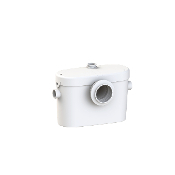 The Saniflo Saniaccess2 is a system that is used to install a half bathroom up to 15 feet below the sewer line, or even up to 150 feet away from a soil stack. It can handle the effluent from a toilet and sink. The Saniflo Saniaccess2 is simplicity itself to install; there are just four connections. When the flush is activated, the water flowing into the Saniaccess2 activates a micro switch in the pressure chamber, which in turn starts the motor. The motor is sealed for life in an oil filled enclosure. A common spindle/shaft drives the impeller and the macerator blades. The moving parts therefore are kept to an absolute minimum. Water and organic waste matter enter the chamber and are reduced to slurry as the macerator blades rotate at 3600 RPM. The centrifugal force causes the reduced solids to be ejected through a grill into the container where it is picked up by the impeller pump mounted beneath the motor. The unit pumps the effluent upward to 15 feet and/or 150 feet horizontally (with gravity fall). Once the water level in the container goes down, the micro switch deactivates the unit until the flush is activated again. A normal operating cycle for Saniaccess2 takes about 10 - 15 seconds depending upon the discharge pipe run configuration; power consumption is therefore minimal. In addition to the toilet waste, the Saniaccess2 will also discharge gray water from a sink. The wastewater will drain into the system via a 1-1/2” inlet which is located on the side of the pump housing. Note that either side connection can be used for the vent or as an inlet. The Saniaccess2 unit must be connected to our rear discharge toilet. This system uses much less water than a regular toilet. Note: This toilet only works in combination with Saniflo systems. All items may be purchased separately. However, the Saniaccess2 works as a system and therefore a toilet bowl (083 or 087), toilet tank (005) and the macerating unit (081) need to be purchased. An optional extension pipe (030) is available for the pump to be installed behind the wall.